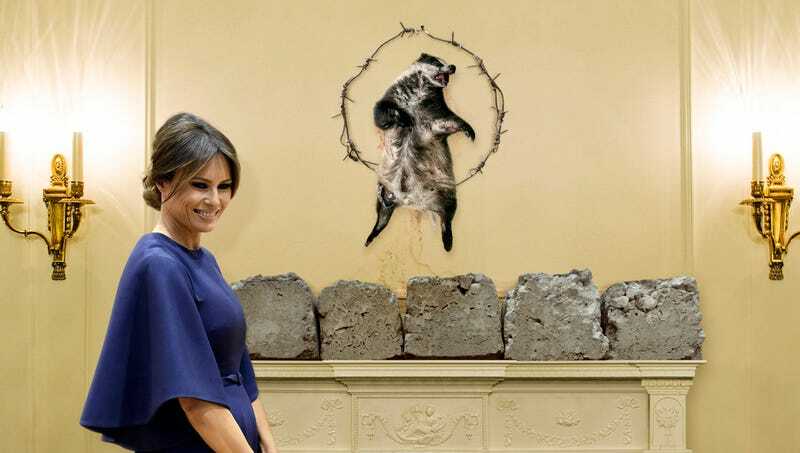 WASHINGTON—Smiling as she found just the right spot for the decoration, Melania Trump hung a decayed badger carcass over the White House mantel Thursday in keeping with the traditions of Slovenian Christmas. “Ah, it finally feels like the holidays,” said the First Lady, adding that the animal’s decomposing remains really complemented the charred Christmas shrub she has set up every year since she was a little girl back in her home country. “The smell of putrefying innards and ash always gets me into the holiday spirit, just like it did in Slovenia. All that’s left is to leave out a bowl of snow broth for Santa Claus and hope he does not smother us in our sleep!” At press time, Melania had gathered her family in the dining room for the time-honored Slovenian Christmas meal of a boiled leather belt divided up and eaten in silence.